The crash occurred at 6:12 p.m. Aug. 5 on U.S. 10 in Mason County's Amber Township. 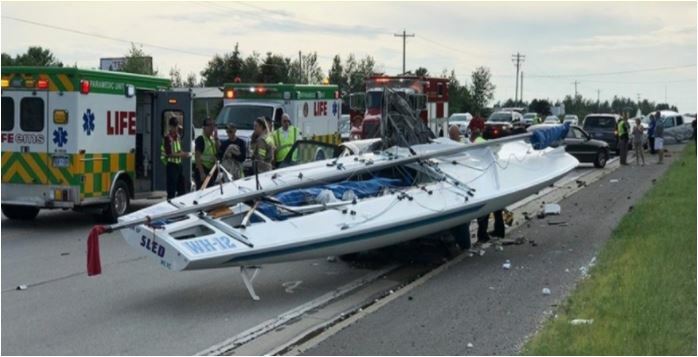 The Mason County Sheriff's Office reported that an eastbound 2005 Chevrolet Impala crossed the center line, swiped a westbound 2017 Chevrolet Silverado pickup truck and then collided head-on with a trailered sailboat. The sailboat went through the windshield of the Impala, killing the male driver instantly, according to the sheriff's office. The age and hometown of the deceased driver have not been released. The crash occurred just west of Stiles Road. The driver of the Silverado, who received minor injuries, has been identified as Michael Stacey, 61, of Grand Rapids. The driver of the vehicle towing the sailboat, who was not injured, is Donald Nelson, 58, of Whitehall, the sheriff's office reported. In a press release issued Monday morning, Aug. 7, Sheriff Kim Cole indicated the name of the driver who died will be released "once positive identification can be made by the Mason County Medical Examiner's Office."